Welcome to the blog! Here you'll see past sessions and learn a little more about each of my clients. Some of my clients have decided to participate in a Baby Plan. They will be my *repeat offenders* so you may see them pop up multiple times throughout the year. Check out the Baby Plans page for more information. Enter your email address to receive news, updates, and promotions. I respect your privacy. Don't worry, I won't spam you. Oh how exciting! Thank you for subscribing! Wishing you a day full of hugs, kisses, and happiness with your Valentine! What a fun start to 2019! Since I am slowing down a bit this year to spend time with Evan, I decided to offer Valentine’s Day mini sessions this year. I thought about offering various mini sessions throughout the year because I can choose the dates, which gives me a little more flexibility in my schedule. I have never offered mini sessions, but these were a complete success! The reason these turned out so cute is thanks to Evelyn Henson! I don’t even remember where I saw her Confetti Hearts Wall for the first time, but I knew at that moment that I had to chose it as the backdrop for Valentine’s sessions. It is a 40ft wall with beautiful colorful hearts and phrases, and it was finished just in time for this event! I would love to see more public art like this around Charlotte, so make sure you follow Evelyn, visit the mural, and tag #confettiheartswall. The more excited we get about these, the more likely they are to start popping up around our communities. I have so many favorites from each session that I wanted to share, so it was very hard to narrow it down. These sessions made for some fun family photos, mother-daughter photos, and sibling photos! Take a look at my favorites from each session below, and comment with your favorite! "I love you more than yesterday, but less than tomorrow." Audrey hit the streets of Savannah, Georgia for her sitter session. We strolled along the beautiful streets near the picturesque squares full of gorgeous greenery, landscaping, and architecture. Even in the hustle and bustle of busy Saturday morning crowds, we were able to capture some beautiful images of Audrey. The perfectly manicured parks, trolleys, horse-drawn carriages, and spanish moss make Savannah, Georgia a dream location for a photographer! I met up with this sweet family of three in the park in Ballantyne, North Carolina. Looking at these photos, you’d never know that we were in the middle of a corporate park. This has been one of my favorite locations for a few years now, and I’m so glad I found it. It’s beautiful, convenient, and has so many great settings within a relatively small space. Once the leaves start changing, it’s the ideal place for a fall family session! This family styled their session perfectly for the fall weather, even though the leaves haven’t truly started changing. The navy and blue palette is the perfect combination for this fun outdoor family session. Everyone looked comfortable and casual, and we had a great time making these beautiful images together. The lighting was perfect and I couldn’t have asked for a better family to photograph! Ty was born at just 27 weeks 4 days, weighing 1 pound 8 ounces. Today, he is celebrating his 2nd birthday! What a long journey - especially for his parents! Sebastian turns two today! Doesn’t he look great?! He is walking, talking, running, and even knows sign language. What a miracle. If you haven’t seen him on my blog, check out his NICU portraits! Baby Plan Members have the opportunity to customize their sessions, allowing them to get many different looks throughout their membership. So far, we have gone to different outdoor locations for each milestone session of Avayah’s Baby Plan. I love trying new places like this one - I will definitely be back! By the way, you might recognize Avayah from when she was a teeny little preemie! Check out her NICU portraits! So so sweet! I am excited to share Evan's nursery with you today, and can't wait to share him with you very soon! Today is my due date, so it seemed like the perfect day to finally reveal the nursery. I am waiting on a few book shelves, but it is mostly complete. When I first started dreaming up this nursery, I knew it had to be white. Call me boring, but I love an all white room. The light bounces off the walls and instantly increases its size! I wasn't quite sure what direction I would go after choosing white walls, but I knew I wanted to stay away from the typical baby blues and keep it nice and neutral. I wanted to incorporate some greenery and plants, so I knew I would also be bringing in earthy colors to tie it all together. I wanted to stay away from a theme, but it turns out that smiling sloths, llamas, and pandas are pretty cute. Overall, it's simple but it's neutral enough that our baby boy can grow into it over the next few years. The wall art can easily be changed and we can incorporate any colors we want since white is so easy to work with. It's also pretty gender neutral if you're looking for ideas for a baby girl nursery. Let me know if you have any questions, and make sure to leave a comment and let me know what you think of our bright, airy boy nursery. This is a story I wanted to share for a while, but it never felt like the right time. Today is Rigdon's birthday, so what better way to kick of the blog for 2018 than sharing about this preemie and his super sweet family. You've probably already seen many of these images on an old post (Remembering Rigdon), but this time they are accompanied by his entire story from beginning to end. Rigdon's mom was willing to write her version of Rigdon's life story, and even found writing about it therapeutic. I can't even begin to understand the emotions Liz and Alan went through over the past few years, especially now that I am expecting a son of my own. I am so happy she shared this with me months and months ago, and I am thrilled to share it with you today. If you have a preemie or have lost a child, make sure to comment with your experience, emotions, and encouragement for this family. If you want a sneak peak into Liz and Alan's next chapter... check out Bennett's Birth. Although Rigdon can never be replaced, this family was recently blessed with another healthy baby boy! "Though some days eternity can feel like forever, I know we will see and hold him again." "Alan and I had always planned on having children. We never anticipated entering into the ‘infertility club,’ and we kept that part of our lives pretty private as we went through all sorts of procedures/testing, but that was our reality, and it was tough. I remember at one point tearfully praying that IF we were blessed with a child, I would do my best to never take them for granted, because I would know what a miracle he or she was—I had no idea how that prayer would be answered, but felt assured that child or no child, everything was going to be ok. I could never have imagined the miracles I was about to witness! We had been trying to get pregnant for a couple of years, and had undergone three IVF attempts by the time Rigdon came into our world. He was decidedly our final attempt through IVF, and we could not believe when we got word that we were going to have a little one! In fact, I don’t think I actually let myself believe it for many many weeks. I had just gotten home from my shift in the ER on Jan 21, 2016, and was getting ready for bed, when my water broke. I was completely stunned. I had just started feeling better with the pregnancy symptoms, and had barely started to feel movement; I couldn’t really process what had happened and honestly, I had no idea how our world was about to change. I think I subconsciously, and rather naively, thought “we got this, things are fine, our little guy has shown us he’s strong before,” and off to the hospital we went. The next few weeks of bedrest are kind of a blur. I had ruptured at 21 weeks and 6 days, and there were a lot of conversations about the lack of much needed amniotic fluid for his lung development in particular, as well as the risk for infection. I had a couple trips to L&D, but the contractions would calm down, and the 3 weeks we were able to keep him in were filled with hope for just one more day for him to grow. We had goals to reach! Our first goal was 24 weeks; we never got to the next one. During that time, I started thinking back to many years ago, when I had been serving as a missionary, representing our church in the Caribbean. One day when I was struggling with feeling tired, lonely, and dejected, one of the leaders of the mission there said to me: “We can do hard things.” There was more, but that phrase has always stayed with me. And that became our motto. We were feeling tired, often lonely and often dejected, but our little family, our little boy; whatever he would face -- could do hard things. 3 weeks after my water broke, February 11th, Rigdon joined our world. He was a tiny 24 weeker, but was bigger than I thought he’d be. He weighed in at 1 pound 10 ounces and was just 12 inches long…but he looked so strong. The delivery was a bit traumatic, but I remember the seconds after I delivered him as being a moment where time stood still. The room was filled with people ready to act in our behalf, and as they held him there in front of me for a few seconds, despite the voices around me, I heard absolute silence. There was no cry. He couldn’t. I could just stare at that little boy for seconds before they whisked him away to intubate and stabilize him. I couldn’t see him, but I remember vividly the words the NICU team spoke as they surrounded him across the room. His heart rate was dropping,..they got him intubated..his heart rate improved.. The NICU doctor came to my bedside and tenderly placed his hand on mine and told me they would let me know when I could come see him and that they needed to take him then. I remember our exit from L&D without my babe in my arms. That was probably one of the first moments I truly realized the ‘loss’ we were experiencing, and would continue to experience time and again. Our entrance to the NICU, was unlike our little tour beforehand, because now OUR little baby was in there. This was now our home. I remember seeing him in his little isolette, and wishing so badly that I could hold him; keep him safe, but also being terrified that I’d break such a tiny perfect thing if I touched him. Every experienced hand that worked with him seemed ‘too rough’ and I knew pretty quickly that this little boy now totally owned his momma. I was going to be there every minute possible to witness his life, support him, and protect him. I felt a growing weight of advocacy I had not understood before. We never wanted to leave! (Though I am sure many times the staff wished we would) We grew more and more obsessed with him everyday and if we wanted to be with him, then we had to be there in the NICU, so we were there in the NICU. We didn’t care to be anywhere else. He is our miracle. He lived in that NICU for 7.5 months (230 days) and our sweet NICU family had become a quite literal family. They will forever be a part of us! They were there to witness every moment by our side. Every milestone was a miracle for us… The first time he opened his eyes, (His eyes were still fused shut when he was born; it was a literal miracle to watch them open in front of us), his attitude with always wanting to kick his feet out of his swaddle, the first feeding, the ridiculously long baths because I was so new and he was so tiny, when he finally weighed enough to wear clothes, moving to an open air crib, and of course, the way he loved to kangaroo. Those are such precious memories that are now shared with people who understand the significance of those miraculous moments in our lives. 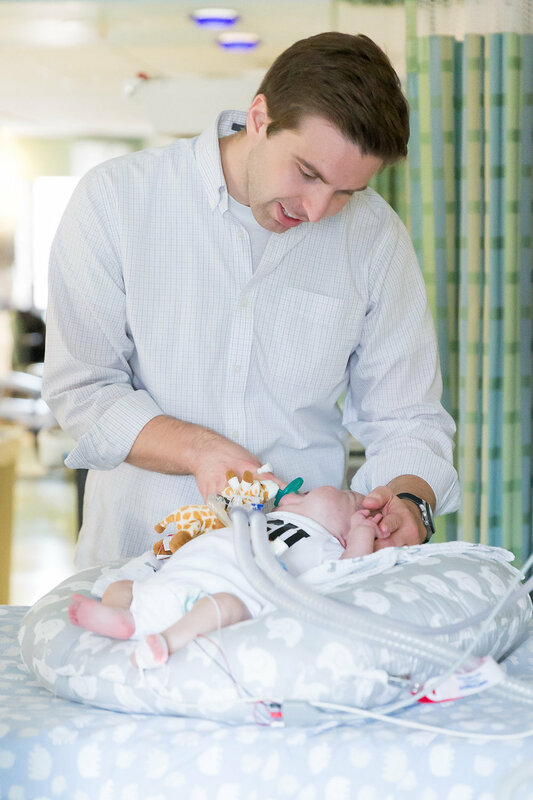 With as hard as it can be to have the hospital be your home, there are some joys unique to the experience, including having witnesses to every single accomplishment your baby achieves… all rejoicing with you because of how much they love him. For every moment of pure joy, it seemed we had multiple moments of anguish. Like most parents, we held to the belief that if he could ‘just get through’ whatever had knocked him down this time, then we could get back to working towards healing and home. Every day was one more day of progress, but there were a lot of setbacks. There were nights we stayed by his isolette all night, for fear of missing our last moments with him. There was rejoicing in the morning when he had made it through the night. There was worsening eye disease until he finally required laser surgery. Then there was recovery. There was infection on top of infection and so many blood transfusions, medications, and drips… all within the first 3 or 4 months of his life. We worried that his body never seemed to have time to grow those lungs that were so very weak and underdeveloped. That became our focus of concern. He didn’t seem to be improving as expected. Rigdon was growing, but his lungs were struggling. He had been tried on CPAP 3 times, and the final CPAP trial lasted 5 days. He was re-intubated on Easter Sunday at 6:45 pm. I remember clearly the moment he was reintubated, because I heard his tiny little lamb like cry as they removed CPAP to place the tube. I only heard his little voice for seconds, and then there was silence. I never heard that little cry again. He couldn’t seem to get off the vent. Then came the tracheostomy. We had spent months hoping he would grow enough not to need a surgical airway. It scared us—not because we couldn’t care for it or him, but because of what it meant. We were so scared about his future, but knew that our miracle baby had fought hard to get to where he was, and we were going to keep supporting him. As long as he was fighting, we would fight right there with him. We chose faith over fear, and he got his trach and G-tube placed in June. There was about a week of recovery with paralytics, pain medicine, more drips, and, of course, infection. It unfortunately, was a setting we had become familiar with. Nothing came easy for our sweet boy, but if I could define strength, it would be him. When he came back from surgery, I was mesmerized by his now fully visible face and spent hours staring at him in his crib. I could now see all his features without tape and tubing getting in the way. He was a perfect angel baby! I became instantly grateful for the trach because I felt I was experiencing an entirely new Rigdon! The weeks leading up to the decision were so hard; filled with heartache and a thousand questions—I had no idea I could feel like I was getting back somehow a more ‘complete’ baby, when I was so focused on what I felt was being taken away. The days and hours always felt long, but time was still passing. We watched many many babies come and go from our little part of the world. We went through cycles of sadness, anger, and hopefulness as we went through multiple ‘roommates,’ often feeling a little left behind. Our tiny little miracle boy had somewhere along the way turned hefty, which served as a reminder of our seeming lack of progress, but also, growing right along with him was the deepest, greatest love we could ever imagine. In being honest, we definitely went through moments of jealousy for others’ babies and the progress they were making, but also found great joy in learning that loving and rejoicing with others did not diminish our own situation or triumphs. And that was a big lesson to learn. Through our extended time in the hospital, I would say my best advice is that we simply cannot compare! That’s the hardest part of having to go through this experience, I think. We want to know the end from the beginning; we want to know how it all turns out, and we find ourselves living for/in the future instead of in the miraculous moments right in front of us. It’s human nature to want to know what’s going to happen, so we try to find others that are ‘just like us’ and somehow use them as a mental guide. We try to compare our struggling child to others’ good outcomes to bring us comfort because “so-and- so went through this and they made it home—so we will, too.” It’s something even well-meaning friends do. “I knew someone that had a baby just like yours, and he/she is completely healthy and you would never know it!” Although, that may be the likely outcome and is meant to give hope, you just never know what is in store for you, and that takes its toll on the heart. Life becomes a constant struggle of balancing hope, realistic expectations, and the ever present gnawing sadness that accompanies watching your baby fight such a battle, and wishing you could do something more. We had to learn that each and every baby is so individual; there are no comparisons. Nobody can tell you for certain what your outcome will be. You just go through it with faith and hopefulness and take things one day at a time, finding the miracles in everyday moments. We had to learn to “let Rigdon do Rigdon.” Learning not to compare helped us to be able to focus on our own little one and rejoice in His triumphs, regardless of what others were doing the next pod over. It also helped us to be able to reach out and form friendships with others because we no longer saw them as “comparables,” but as individuals with their own individual struggles, fears, and joys. Those friendships have meant so much because a natural byproduct is even more people to love our babies! Of course, there were hard days where we didn’t want to be the friendly veterans, we didn’t want to be in the NICU ‘club.’ Nobody does. We just wanted our turn to take a healthy baby home… But overall, I could never fully describe the love and sacredness of our time experienced within those walls. That was home for us. Discharge day finally came! I cry every time I think about that day. Truly, there was no better day than the day we took him outside those hospital walls to come home. The amount of equipment required for him was daunting, but was completely overcome by our excitement and desire to watch him soar. He was as stable as possible, but not in a great place to be honest, and we really felt like if we could just get him home where he belonged, then he would begin to really thrive. We dreamt of our walks outside, getting him up from his crib in the next room, playing by our big window on the floor of our living room... we didn’t want to take a single moment for granted. We wanted him to experience being surrounded by the peace of being home, and we will cherish forever the time we did have to give him that. Rigdon loved being home. We knew it. And We loved it even more! That’s why it was so heart wrenching to see him start to decline. He required more support and we had to experience many parents’ worst nightmare of having to resuscitate your own baby. We knew we had to go back. About 3 weeks after getting him home, we went back to the hospital, this time at LCH where his pulmonologist was, and we were there to stay. The holidays approached and we knew he was nowhere close to where he needed to be to return home. As had been the case many times before, we were told he was not progressing as expected. We weren’t sure why he wasn’t improving, but kept holding on to the hope that he could overcome his BPD with more time. That timeframe kept getting longer and harder for him. Christmas week was actually a really good week for him, and I think that was a blessing meant just for me. We had a beautiful family Christmas and even took our first family photo to include our surprise miracle baby #2! After being told this would likely never be a possibility for us, we just knew this was another miracle in our lives, and a purposeful blessing given to us for a reason. Two days after Christmas, Rigdon started to really struggle, and by New Year’s Eve, he was in really bad shape. He had never been like this before. Things were different this time. He was placed on paralytics, the oscillator, multiple sedation and pain meds, and for the next couple of weeks, we watched for him to show us he could get through this once again. The months had been difficult, but he always seemed to have just enough strength to get through. He’d never quit fighting, but this time seemed to be too much for his body. We had been living in his room with him during those final weeks, and when he passed, we held him as tightly as we could physically hold him, as we watched our beautiful miracle baby boy slip away. We found out we were having another baby boy just days before Rigdon passed away. There is no replacement for our perfect angel boy, and there is a constant throbbing and loneliness for him that I am having to learn to live with now in my heart, but I can say with certainty that his life was full of purpose and we wouldn’t trade a minute of our time with him. He has forever changed us (I hope for the better), and our family, and pretty much everyone that ever knew him. We didn’t get the outcome we hoped for, but the influence of his life continues to unfold in front of us daily. I can say we never took him for granted, as I prayed so long ago, and am so grateful for every long day and night with him… every memory still feels so raw, so fresh in my mind. There is no “moving on” when it comes to missing your baby. Only moving forward. And sometimes, like Rigdon, I feel I am doing that on a sliding backwards slope. BUT – there is meaningful purpose in his life and that helps as we find the joy of having learned to love so deeply and the blessing he is and forever will be to us. I hope to be able to help other moms feel some sense of comfort knowing that I know, with faith and through experience, that we really can do hard things, whatever the outcome, and it will be ok."
The Queen City Quints were featured on Click Magazine's Blog today! Seeing my work in the May/June issue of 2017 was amazing. It's one thing seeing my images when Iprint products through my professional print lab, even if it's just a client order. Seeing it in an actual magazine is another story, because you know so many other people are going to see your work - and judge it! I made a list of goals for 2017, but honestly... being published wasn't on that list. I ended up being published twice this year, and I couldn't be more honored. I'm excited to see what 2018 brings! Click the image below to read the article on the Click Magazine Blog or subscribe to the magazine for more photography education. This is Eliza's sitter session, but I'm so glad that mom and sister decided to jump in. Typically, I'm pretty flexible when clients get a membership to the Baby Plan. I love to add variety to the sessions so that the interactions of the baby with mom and siblings at this age are not missed. I love a quick session with just the sitter alone in my studio or at a park in Charlotte, but there's just something about this mother/daughter session that has me oooing and ahhhhing every time I look at it. Click play on this beautiful session styled so perfectly by the client herself! Cara not only has great taste in clothing, she also has the most beautiful children and they live on this beautiful piece of land. When those three things are combined, it makes for a gorgeous fall outdoor session. Watch this video and let me know what you think of the style and setting of the session. I am obsessed with how it turned out, and I hope to photograph more sessions like this in the future. Santa Has a Gift to Give... Who will be the lucky winner? Just in case you missed it, Santa sessions are open for booking. The first family to email krista@kristagantt.com wins the discounted session! There are no strings attached, and winner will receive a discount code to redeem at checkout. Email first to be the winner! Santa Claus is coming to town, and he is bringing Mrs. Claus! Just in case you missed it, Santa sessions are open for booking. Santa is bringing someone sweet with him! Join Krista Gantt Photography in the studio for modern Santa sessions with Santa AND Mrs. Claus! Who wants to wait in lines? Come join Santa and Mrs. Claus in a comfortable and calm environment, on a clean modern set. Avoid the chaos of mall Santa's and winter germs, and actually enjoy the experience. Kids can wear PJs or their Sunday best. Siblings can be photographed together or separately. Light snacks and drinks will be provided. Children under 12 only, please. Sessions will take place in my home in Mint Hill, North Carolina. Due to the high demand and limited dates, there will be no refunds for these sessions but your appointment may be transferred to another client in the event that you are unable to attend. Studio is located upstairs with no elevator access. The phrase "perfect timing" has never been so...perfect. I was just coming back to Charlotte, North Carolina after traveling when I received a message from Liz. You might remember her from my post about Rigdon. Rigdon is Liz and Alan's son who was born at just 24 weeks and 6 days. Rigdon's NICU stay was a roller coaster to say the least. Liz initially reached out for me to photograph him in the neonatal intensive care when he was 12 weeks old. Due to so many complications during his stay, the session never happened. I was finally able to catch up with Liz to photograph Rigdon's discharge home from the NICU. He was able to spend a few weeks at home, but was later admitted to the pediatric intensive care unit. He remained there until he passed away in January of this year. He would have been 1 year old in February. A few days before Rigdon passed away, his parents received the news that they were pregnant with a baby brother. For some reason, Liz and I immediately clicked when we first met that day in the NICU for Rigdon's NICU portraits. Not only is this couple just THE sweetest, but they are so warm and grateful for everyone around them. Liz is also a medical professional, so she understood Rigdon's complications all too well. They were so prepared to love on Rigdon the rest of his life, no matter what the cost. Liz invited me into her home for an in-home newborn session, and I was so thankful that she trusted me to capture these memories. Their NICU portraits were completely free, as a part of the complimentary NICU portraits I offer. The fact that they were willing to invest in my business meant so much. I felt a little tug at my heart when I heard the news of Rigdon's passing and Liz's pregnancy. I have always been interested in birth photography. I love the idea of capturing all of those emotions and everything else leading up until that magical moment. I wanted Liz to be able to enjoy this time a little more than the last time she did it. I told her from the start that this experience would be different. It was going to be magical. I just knew it. I knew this would be a happy and healthy baby, and I wanted Liz and Alan to be able to focus on each other and be present. In the world of social media, it's hard to not pick up our phones during monumental events, because we want to remember every moment. Well I wanted to take that pressure away, and do this for them. Working full time and working 12 hour shifts in a neonatal intensive care unit doesn't allow the flexibility I need for any kind of on-call photography. I told Liz that I couldn't make any promises that I could make it on time, but I would certainly try. I've only photographed one other birth, which resulted in a c-section that I was not able to attend. This time around was going to be different I hoped! I threw all of this at Liz and offered my services. Without any real experience (other than deliveries I'd been on as a nurse), she allowed me to be a fly on the wall in her delivery room during the birth of Bennett. The crying brought me to tears. Not only was I seeing the magic I knew would happen in these moments, but I knew that this little cry was oh-so-important to Liz and Alan. You see, they didn't have the chance to hear Rigdon cry when he was born. At just 24 weeks, he was not able to cry. Rigdon was quickly shown to Liz and Alan and then whisked away to be intubated and stabilized. Most people take that first cry for granted. Most can't even imagine a baby coming out and NOT crying. For Liz and Alan, this was probably the moment when they knew that things were going to go very differently this time around. These images are just a glimpse into Bennett's entrance into this world. A little sample of the emotion, a little sample of the perfect baby boy that went home safe and sound with his mom and dad just a few days later. Bennett is eating, sleeping, and growing like he should and has brought so much joy to Liz and Alan. I'm so grateful that they allowed me to photograph this experience, and I'm thrilled to share these with the world. A beautiful new chapter. Stay tuned for Bennett's newborn session images. Be on the lookout for Bennett's newborn session, coming soon to a blog near you! These family portraits are some you don't want to miss! If you've been following me for even a minute, you've probably seen sweet Brooklyn. She's the sweetest little red head who is now turning blonder by the moment, and growing up right before our eyes! The McKees are sweet friends of mine, and I'm so appreciative for their continued support of my business, and that they have chose to grow with me as their family grows. I work with Amy at the hospital before she had Brooklyn and we were fast friends. She's the sweetest, most genuine person. I'm so glad to call her my friend! Not only is she a great friend, she's so patient with Brooklyn, and she's a wonderful NICU nurse. These family portraits were taken at one of my new favorite locations for a family session. It's located in Ballantyne, so it's not too far outside of Charlotte. The McKees are always willing to drive to great locations to create beautiful images like these. We hit the park at the PERFECT time of day for lighting - that golden hour, though! Make sure to scroll to the bottom for a sweet little [big] announcement! Congratulations Amy, Elliot, and big sister Brooklyn! I met Charlee on a beautiful spring day. One of my favorite parts about meeting her was the drive down a long dirt road to her house. Most homes I visit in the Charlotte area are in neighborhoods with homes side by side, but Charlee's home is at the end of a gravel road without a neighbor in sight. I always grew up in a neighborhood, so being away from the city is always refreshing to me. Charlee was born weighing a dainty 5 pounds 9 ounces. She did wonderful at her in-home newborn session and is such a sweet baby. Her big brother is still getting used to not being the star of the show, but I think he secretly loves his baby sister. You may remember Charlie from a few photos floating around on my Instagram page. When we first met in the NICU last October, Charlie was just over 2 weeks old. He came into this world weighing right at 1 pound. You read that right. Charlie weighed 1 pound 0.02 ounces to be exact. Although Charlie's life was short, he fought hard to be with his mom and dad. Here is Charlie's life in a nutshell, as told by his mom. It all started on May 15, 2016. I wasn’t feeling so great and I knew I was late, so I decided to take a pregnancy test. Well it came back positive, and I decided to take 5 more tests just to make sure (I was very surprised). On June 6th we ventured to the doctor to hear Charlie’s heartbeat for the first time. My regular OB/GYN did some blood work and tested for Down’s syndrome but it came back fine. My numbers came back somewhat high for Spina Bifida, so I was referred to a Maternal Fetal Physician. On August 2nd, Dr. Shaver confirmed we were having a little boy (quite the surprise for me). Charlie was quite active in the tummy and they found that he did not have Spina Bifida. However, the doctor did talk to us about the possibility of preeclampsia. I didn’t think that kind of thing would happen to me. On September 16th (my birthday) I had a severe headache and could not function very well. By September 19th, I was being admitted to “Special Care” at Presbyterian Main to be monitored for preeclampsia. I was followed closely and Charlie’s heart rate would drop from time to time, which was a cause for concern. On October 3rd I had an ultrasound. Charlie’s heart rate dropped significantly while they were conducting the ultrasound, and that lead to me being sent to L&D for 24 hour monitoring. At 3:45am, I had to use the bathroom and when I returned, the nurse was unable to get Charlie’s heartbeat, even with the assistance of other nurses and a doctor. Charlie was born weighing 1 pound 0.02 ounces and measured in at 10.25 inches long. The doctors prepared me telling me that since Charlie was born so early, he probably would not make any noises when he was born. I prayed and asked for a sign that he was ok. When Dr. White held him up for me to see, he screamed and cried. I cried at that moment because it was the most beautiful sound I had ever heard. I didn’t realize it would be the first and only time I would ever hear him cry. Upon Charlie’s arrival, Chris met with Dr. Morales and Kayla (nurse) and they talked to him about Charlie. Kayla told Chris that he had nothing to worry about because she would be taking care of him that day. They wheeled me into the NICU from recovery and I was able to touch Charlie for the first time. I could not get over how little he was and that his eyes were still fused shut. In the following days, we had a lot of ups and downs. The first big hurdle was on October 9th when Charlie was at 100% oxygen. I remember the neonatologist telling us that we didn’t have a lot of options at that point because his lungs were in such bad shape and he needed so much support. Chris and I just looked at each other and cried because we knew he was very premature. Everyone tells you about the roller coaster ride called the NICU. It was on October 9th that we decided to have Charlie baptized. We wanted to be prepared if anything should happen. We celebrated each milestone as it came... whether it was weight gain, being able to tolerate feeds, skin to skin contact, or something as silly as my first experience with breastmilk poop. Charlie was a feisty little guy. I couldn’t help but laugh when the nurses would tuck him in and swaddle him and he would somehow break free, whether it was his little legs kicking or it was his arms. Out of nowhere, you would see his arm go up in the air like a defiant victory. It might sound silly but I enjoyed changing his diapers, taking his temperature, wiping his face and just having those few minutes touching him and talking to him, so that he knew I was there. In the morning when I would arrive, I would sing songs to Charlie and talk to him about the great big world. At night time I would go back and read him a bedtime story. His favorite story was “On the night you were born.” I say this was his favorite because it seemed to be the one story that I read to him when he would open his eyes and look around. My most treasured memories were either when Charlie would grab my finger and hold it, or when we had our skin to skin time and I could just sit there and snuggle with him. I received a call from the Pediatric Surgeon on 11/26/16 and he informed me that they needed to do exploratory surgery bc they thought Charlie might have Necrotizing Enterocolitis. I would not give verbal consent. I wanted to see Charlie before they did the surgery and I made it to the hospital in time. I got to hold him with the assistance of a Respiratory Therapist until they got his bed set up. They told us he had a 50/50 shot of making it through the surgery, and I remember thinking and feeling like this was all of my fault becasuse of the preeclampsia. I felt like my body failed Charlie and put him through more pain than I went through. Charlie made it through the surgery and did great. We stayed overnight at the hospital just to be on the safe side. I woke up at 1:45am because I wanted to be at his bedside for his 2am assessment. I received a text at 1:50am from Charlie’s nurse telling me that we needed to get to his bedside. I woke Chris and we went running. As we turned the corner we were not prepared for what we were about to see. A nurse was giving Charlie chest compressions. His primary nurse had just given him a dose of epinephrine because his heart rate dropped and it was not coming back up. Once they were able to get him stabilized, Chris and I made phone calls and some of our family members came to the hospital. Charlie’s nurses all showed up. Charlie really knew how to draw a crowd and get the emotions going. Around 9pm Monday night, we started to realize that things were not going as well as they were earlier in the day. Charlie was on 3 different blood pressure medications to bring it up, but nothing seemed to be helping. He just looked so tired. It was at that time that I looked at Chris and I told him that Charlie is getting tired and that we needed to make a decision. He looked at me and shook his head yes. Dr. Morales was getting ready to approach us and tell us about the terrible blood gas that he just had, but I stopped her and said that we knew he was tired. We wanted them to go ahead and unhook Charlie from everything and place him in my arms, and that is how he would leave this world. Our families and nurses were there and said their goodbyes. We then asked our families to leave and we only wanted Charlie’s nurses, our Deacon and Dr. Morales there. The nurses dressed Charlie and laid him in my arms and Chris sat next to me. I sang to him and told him that we would never be angry for him not wanting to fight anymore. After about 5 minutes, Dr. Morales came over and listened to his heart and looked at us and said that he was no longer with us as of 1:24am. Dr. Morales and Kayla were there when Charlie came into this world and they were there when he left and that meant so much to us because we had such a wonderful relationship with them. When they removed the ventilator tube, I felt so heartbroken but when I looked at my sweet boy, he had this beautiful smile on his face. It was like he was happy and at peace and I felt like maybe my dad was there to greet him in Heaven. You came into this world on October 4th and changed our lives forever. It seems like only yesterday that we had heard the most beautiful sound upon our ears when you cried. It gave us the greatest comfort knowing that you would be our little fighter, our superhero. We had no idea at that moment that we would gain not only a beautiful little boy in our lives but also a family we didn’t know we would be blessed with. Eight weeks may not seem like a long enough period of time to change people’s lives but you certainly did sweet boy. Your personality was enormous for such a little peanut. It was not unusual for you to go from swatting your little hands at your nurses and sometimes even mommy to grabbing the finger of those giving you the loving care you received. It was comical to watch your nurses work so hard to bundle you up, only for you to sneak your little arm or leg out and shake them in defiant victory. As if your personality wasn’t enough you were blessed with golden blonde hair and big blue eyes and it is plain to see how you captivated the hearts of all who met you. Speaking of those captivated hearts, as you know they are here with us celebrating you. You may not recognize them without their scrubs on, but we know you recognize them by their love and devotion to taking care of you. Whether it was comforting us when you were having a rough day or celebrating milestones with us, their resolve never wavered. We could fill volumes of books with the hopes and dreams we had for you. In spite of all of those things we wanted our perfect little boy to be a good person. You exceeded our hopes and dreams in these 8 weeks we were blessed with. You taught us more about unconditional love and compassion than we could have imagined. You made a difference in a way that most people can only dream. We love you very much, sweet boy, and miss you terribly. There is not a minute we don’t miss you. We can only take comfort in your being set free from the pain and struggle you fought so hard through. You overcame many obstacles in your time on this earth, with great perseverance. There isn’t anything we wouldn’t give to see your beautiful blue eyes looking at us, or feel you squeezing our fingers and not letting us pull away from you. Watch over all of those gathered here and those who were blessed with your presence. We all have an extra guardian angel now to watch over us. You are loved and missed so much Charlie, and you always will be. I want other moms to know that they are not alone and that this is a unique club that no one ever wants to be in. I never in a million years thought that I would be cremating my 7 week old son. I still to this day struggle with the feeling of my body failing Charlie and causing him more harm and pain on the outside. There are triggers everywhere and somedays I can walk around the mall or a store and be ok and other days I can walk in and walk right back out because of my anxieties and triggers. I have a few friends who have suffered miscarriages which is still the loss of a child but they cannot fully relate to what I struggle with because we had Charlie for 7 weeks and had a different experience. Chris and I started attending Kindermourn for grief counseling which has been great. I started going to a support group last week called “Empty Arms,” which specializes in miscarriages, stillborns and infant loss. The first meeting was definitely eye opening for me. I didn’t expect to be in a group with 4 other couples and myself (Chris does not want to participate in the group) discussing the loss of our children and talking about the trauma that we suffered. One thing that I have learned is that men and women definitely grieve differently. That is something to be prepared for. Do not let people tell you that whatever you need to do to help you grieve is wrong. There is no handbook on grieving or how to cope with the loss of a child and everyone grieves in different ways. One other thing I wanted to mention is that it is ok to need medicine to help with depression or anxiety. It does not have to be a permanent thing but it can help especially when you are going through so many emotions and it can be very hard to handle. Mother's Day Event 2017 Announced! If you didn't hear, today I announced a wonderful event. A personal goal of mine this year was to photograph women. When Mother's Day started approaching, I decided it is the perfect time to photograph multiple women in one setting. Why not celebrate your mother by spending time with her making memories. Bring your daughter too, and we'll make it a family affair! You will all cherish these images for years to come. I had so much fun with my guinea pigs, and I can't wait to take your photos too. Click the image below for more information about this wonderful opportunity to spend time with your mother. It's the greatest gift you could give her. Dads... take this opportunity to gift your wife or daughter with a special mother's day session. If you have a daughter, you should gift yourself with a session! I don't need any more info - I'm ready to book my session!